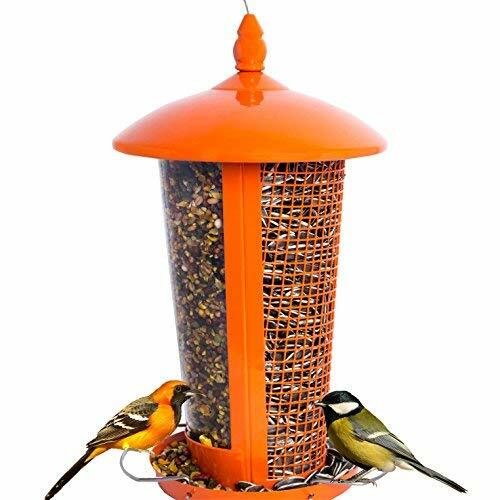 Infinity Bird Feeder - Wild Bird Feeder with 360 Degree View of Feeding BirdsCategory: Attract Birds Bird FeederThe Infinity Bird Feeder: Wishing Well Model by Heath Outdoor Products provides a clear view of the feeding birds. It combines the seed storage of the traditional hopper feeder with the view of the platform feeder. Its design includes a low seed indicator (when the bucket becomes visible, it is time to refill the seed well). Pennington Classic Cedar Nature's Friend Wild Bird Feeder, 3 lbs Seed CapacityCategory: Attract Birds Bird FeederThe Pennington Classic Cedar Nature's Friend Bird Feeder is great entertainment for your backyard. 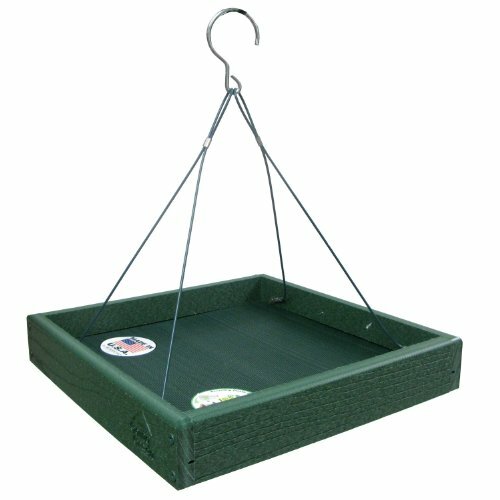 This feeder is easy to fill and ready to hang, holding up to three pounds. 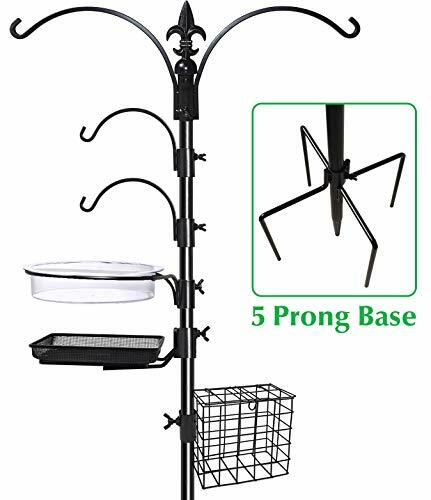 Bird Feeding Station Kit Stand with 5 Feeders for Attracting Wild Birds, 23"D x 88"HCategory: Attract Birds Bird FeederCollections Etc - Providing Quality, Value And Service For More Than 50 Years!Collections Etc is all about smiling more and paying less. They take pride in offering affordable items every day; from classic Home Decor to helpful Home Solutions, whimsical Garden Sculptures and unique Holiday Gift ideas for everyone in your family, even your pets! 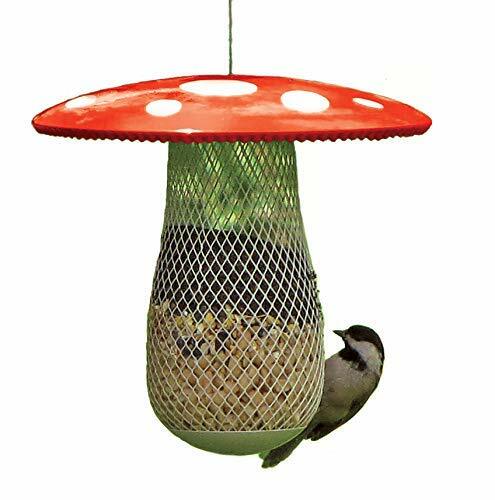 More Birds Squirrel-Proof Feeder, 4.2 Pound Seed Capacity, 4 Feeding Ports, X-1Category: Attract Birds Bird FeederOur revolutionary Squirrel X1 squirrel-proof Songbird Feeder protects your birdseed and allows you to feed the birds not the squirrels! Featuring four squirrel-proof feeding ports with long, sturdy perches, the metal sliding sleeve will close all ports simultaneously when a squirrel’s weight is applied to any perch or the roof. The feeder holds up to 4.2 pounds of seed and has a wide mouth for easy filling. The lovely satin nickel finish will complement any outdoor décor and blend in nicely with nature. Keep squirrels out of your feeder with our More Birds Squirrel-X1 Birdfeeder. Pennington Planter 2 Pack Hummingbird Feeder, 2.3oz eachCategory: Attract Birds Bird FeederMaximize your garden’s appeal with the Pennington Planter Hummingbird Feeder Two Pack. This pack contains two hummingbird feeders and two rust-resistant shepherd’s hooks that make an ideal addition to planters and hanging baskets and are sure to help attract plenty of hummingbirds for your birdwatching enjoyment. 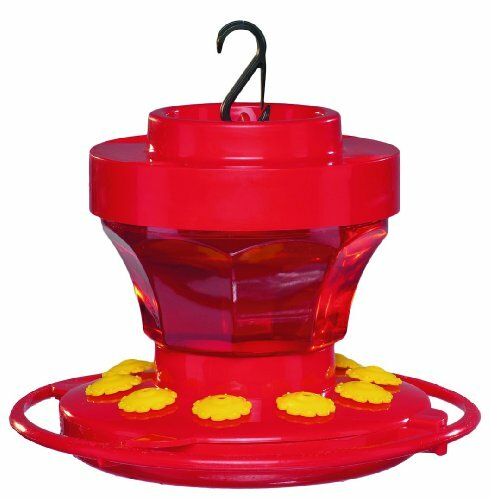 Each feeder holds 2.3 fluid ounces and features a bright red base with flower-shaped feeding port for maximum attractiveness that hummingbirds won’t miss. Attract twice as many hummingbirds and liven up your garden this summer, with the Pennington Planter Hummingbird Feeder Two Pack. Perky-Pet Holly Berry Gilded Chalet Wild Bird FeederCategory: Attract Birds Bird FeederThe Perky-Pet Holly Berry Gilded Chalet features a circular perch that invites birds to feed from all angles. 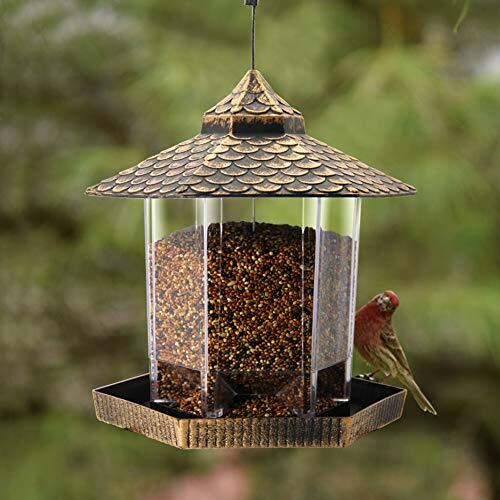 This attractive plastic feeder has a lid with an embossed holly berry pattern and is treated with a UV inhibitor to protect it from the sun and prevent fading. This gorgeous feeder can hold up to two pounds of seed, and with its patented Sure-Lock cap system it will reduce your amount of fill times. 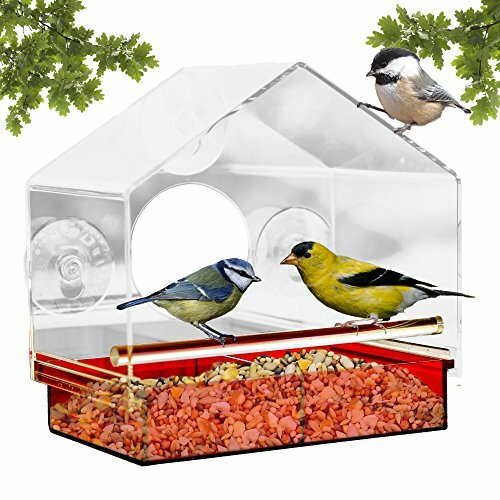 Perky-Pet Small Panorama Wild Bird FeederCategory: Attract Birds Bird FeederThe Perky-Pet Small Panorama Wild Bird Feeder is sure to attract many birds to your backyard. The innovative design of this feeder allows the seed to dispense into the tray and stops dispensing once the tray is full. As the birds continue to dine from the circular perch, the seed is replenished into the tray so it remains consistently full. This feeder also features the Sure-Lock cap system, an exclusive squirrel proof feature which ensures the lid stays put and squirrels can't get into the seed. The Small Panorama holds two pounds of seed and features a rustic brown finish. Remember to clean your wild bird feeders every two weeks with a mild soap and water solution. 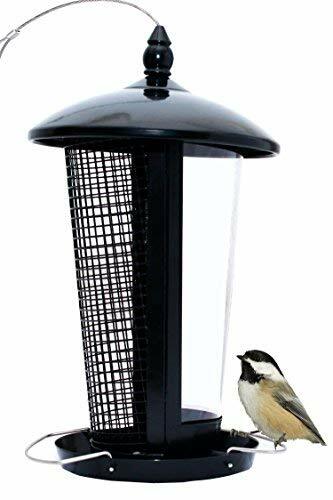 Sorbus Bird Feeder – Circular Perch Hanging Feeder Bird Seed More, Premium Iron Metal Design Hanger, Great Attracting Birds Outdoors, Backyard, Garden (Bird Feeder - Lantern Style)Category: Attract Birds Bird FeederWatch birds fly into action all season long with the Sorbus bird feeder! Enjoy the vibrant, majestic beauty of bird watching! This classic hanging bird feeder is the perfect way to attract beautiful birds to your home. It features a lantern style mesh frame to feed a variety of birds from all angles. Watch as finches, cardinals, woodpeckers, and more flock to this adorable bird feeder for a tasty meal or simply to rest. Hang anywhere to beautifully complement your patio, garden, or backyard landscape. Hang your bird feeders anywhere birds are safe and you can enjoy the view. For an enjoyable activity inside, look out the window and view the colorful birds as you relax and unwind for the day. Outside, hang your bird feeders near a window, tree, fence, in the garden, or on the side of your home for display. Kids and grandparents will especially be entertained as our feathered friends flock to the backyard deck for an afternoon snack. When the seeds are gone, kids can get involved and help refill the seed supply. The caged frame allows you to see exactly when it’s time to replenish and it’s easy to fill by simply raising the top lid. Heavy duty design that is easy to fill and hang. Each birdfeeder is designed with a lantern style mesh design, rooftop lid closure, and loop hanger. Made of powder coated iron construction with black finish. It’s compact, lightweight, and easy to fill with a top opening . Seeds NOT INCLUDED. Measures approximately 6.75 L x 6.75 W x 20.75 H (Overall). Enjoyable activity for elderly, children, nature, garden, and bird lovers everywhere! CB & Sons Humming Bird Elixir Feeder Attracts Hummingbirds All SeasonCategory: Attract Birds Bird FeederHummingbirds are the smallest bird in the world, but truly one of the most fascinating creatures on the planet. Hummingbirds are famous for their aerial display. They can fly up, down, forward, backward and sideways. And they can stop in mid-air! Because of their high metabolism, hummingbirds spend a great deal of energy flying so they must feed almost constantly. 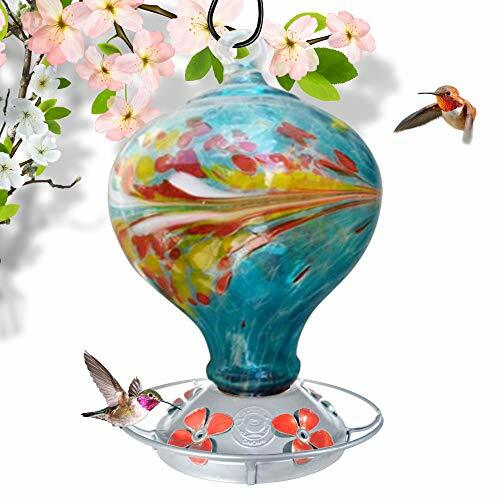 The Elixir Hummingbird Feeder features a red antique glass bottle and a bronze base with five feeding stations. 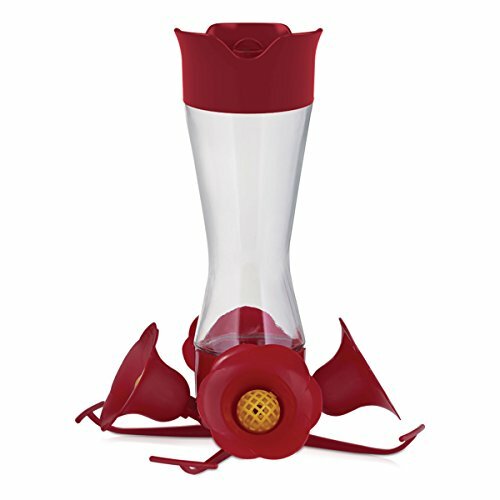 Our red hummingbird feeder is designed to draw the attention of hummingbirds who typically feed from red flowers in the wild. The 13 ounce capacity will provide enough nectar to keep your resident hummingbirds full, happy and coming back for more! Antique bottle hummingbird feeder 13 fluid ounce nectar capacity Wide mouth bottle is easy to fill and clean Five feeding stations Hanging Your Hummingbird FeederHummingbird feeders can be either hung from a strong branch/shepherd’s hook or they can be pole or post mounted, but make sure your nectar feeders are at least 20 feet from your seed feeders. Hummingbirds are very territorial and may attempt to drive off your seed eating birds if they are too close to your nectar feeders. Also, to keep your nectar cooler and fresher longer, hang your hummingbird feeder where it receives minimal direct sunlight. Tip: You can plant nectar producing flowers that will also help attract hummingbirds to your feeders. Cleaning the FeederYou should clean your hummingbird feeder every three to four days. Use only warm or hot water and a soft brush to clean the feeder. Hummingbirds do not like the taste of soap so you should never use soap, only use diluted down bleach to clean your feeder if necessary. More Birds Feeders by Classic BrandsClassic Brands is a family-owned company with over 100 years of management and design experience in the birding industry. We are also a company comprised of individuals passionate about birds. We took careful time and consideration to develop quality birding products to bring more birds and more joy into your yard. After talking with bird lovers all around the country, we took what they know and combined it with what we know to make feeders that are better for you and better for the birds. All our feeders are easy to fill, easy to clean and our Stay Full Port; provides constant food at each perch. Our feeders serve any seed so you can select the favorite food your desired bird likes. Plus, with the adjustable perches, you can tailor the feeder for the birds you want, allowing you to truly Choose Your Birds!